Monastic culture has not only shaped France, it has also been a prerequisite for the country to be able to develop and refine the wine culture in a unique way. But monastic life is not on top of the French youth's priority list, obviously they find a lot of other attractions. As a consequence of the weak recruitment to the orders, for example, Couvent de la Divine Providence in Ribeauvillé has been forced to cease their wine operation, and from 2006, Trimbach has fully responsible for the superb monastic vineyards. 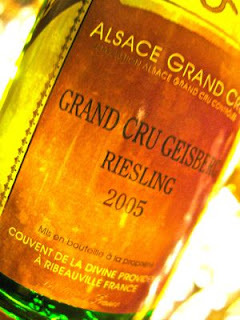 2005 Riesling Grand Cru Geisberg from Couvent de la Divine Providence has developed aromas of dried figs, orange marmalade, honey and geranium. 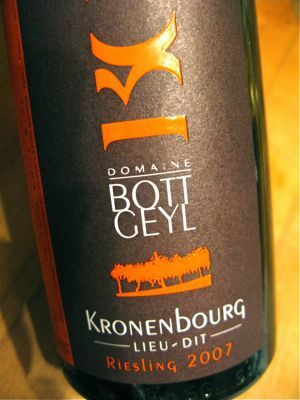 On the plate it is medium-bodied, rich, fruity and elegant with nice acidity and a wonderful sense of grapefruit peel in the aftertaste. 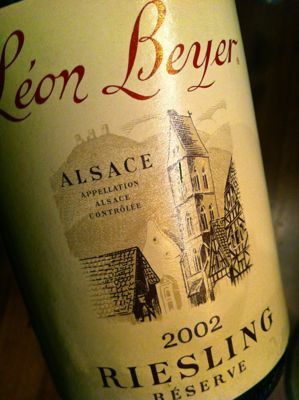 Alsace Grand Cru wines may (almost) only be produced from the four "noble" grapes. However, many growers have love to have some Pinot Noir, Auxerrois and Sylvaner on their prime land. To make the terroir visable for the customers, many chose to name their wines with a clear reference to the Grand Cru in question. 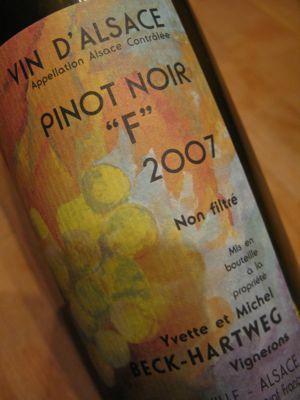 That is why we see Pinot Noir "P" (for Pfersigberg), Auxerrois "H" (for Hengst) or Sylvaner "Z" (for Zinnkoepflé). 2007 Pinot Noir "F" from Beck-Hartweg in Dambach-la-Ville has grown on Grand Cru Frankstein. The color is brilliant and show some sign of maturity. On the nose, the wine offers cinnamon, cassis, raspberries and vanilla. The taste is light, fresh and elegant with very good Pinot fruit and a mature tannic structure. Price: € 10.